Lay one of the phyllo sheets on a work surface, crosswise. Brush lightly with melted butter. Place another sheet of the phyllo on the first one slightly offset towards you. 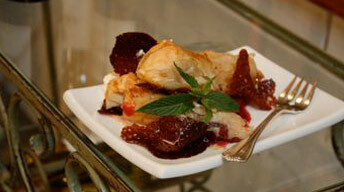 Brush with butter, and then place the 3rd phyllo sheet in the same position as the first one. Again brush with butter. Place the apple filling in an even line across the bottom of the phyllo about 3 inches from the edge and 2 inches from either end. Fold the bottom over the filling and then begin to roll the strudel towards the top edge. Fold the ends in and continue rolling the strudel into a log, be careful not to make it too tight. Move to a jellyroll pan that is lined with parchment and brush the top with butter and sprinkle with the vanilla sugar. Place in oven and bake 15-20 minutes or until golden brown. Remove, cool slightly and cut diagonal pieces to serve. Serve with crème anglaise and maple syrup sauce. Heat the butter in a heavy sauté pan. Add the sugar and Chateau Ste. Michelle Late Harvest Riesling. Bring to a boil and cook over medium high heat until the sugar caramelizes. Add the prepared apple slices, dried cherries, and vanilla. Cook for about 3-5 minutes to slightly soften, stirring carefully to avoid breaking the apples up. With a slotted spoon remove the apples and cherries, then cool slightly. Carefully blend in pumpkin, spices, hazelnuts, and mascavado sugar to the apples - this is the filling. Cook the syrup over medium high heat to thicken slightly, and then add ¾ cup maple syrup. Remove and cool -- this is the maple sauce. Whisk together in a bowl the egg yolks and sugar. Heat the half and half in a heavy bottomed sauce pan until it comes to a boil. Remove from the heat and drizzle the liquid slowly, while whisking, into the egg mixture. Return to the pan and cook over medium heat, stirring constantly until slightly thickened and coats the back of the spoon. Remove from the heat and strain into a bowl, then put the bowl in ice water to cool quickly. Add the vanilla.